Toyota's group Vice President confirms that the 2015 model year will be a year of change for the Camry. Based on his comments, here are our updated predictions for the America’s number one selling car. We at Torque News have been speculating since the formal details of the 2014 Toyota Camry were released that 2015 would be a year of change for the model. Back in the middle of October we wrote a story asking “Is This Car the 2015 Toyota Camry?” Our story came with a photo showing the Toyota NS4 plug-in concept car. We have since followed up with stories suggesting that the next redesign of the Camry might feature a turbocharged four cylinder engine and a possibly a CVT transmission, like the new Corolla has just received. Readers responded at TN and on chat room forums that I was crazy, and that Toyota has a rigid 6-year model redesign cycle. This week Bill Fay, Toyota’s group Vice President, confirmed in an interview that indeed changes are coming to the Camry in 2015. Mr. Fay would be in big trouble if he detailed a coming model while still two years away. However, he did make it clear that the 2015 Camry will be different. Speaking to Bloomberg in an interview he said about the 2015 Camry “It’s safe to say we’ll be doing something with it. We’ll be paying significant attention to Camry next year.” Going further Fay said “We’ll make some effort through the collective team to keep it No. 1 next year.” If anyone is looking for more confirmation that that Camry will be changed in 2015 they will have to wait at least until the auto show season begins in fall of 2014. Based on Mr. Fay’s carefully worded confirmation that the 2015 Camry will indeed be different, we think at this point the platform will not be the big change. Automakers can do amazing things with the looks of a car and still use the same underpinnings. Also, the chassis and suspension of the Camry is not a problem for the 400,000 or so buyers of the car. It is currently leading the Accord by 40,000 units in 2013 running sales (about 10% ahead). On the other hand, the Accord is new and significantly improved. It may start to close that gap or pull ahead of the Camry in 2014. Given the chassis stays the same here are the changes we predict for Camry in 2015. The folks buying a Camry want it to look like a Camry. However, the car needs to change over the evolution of the model enough to stay contemporary. Therefore, we speculate that the Camry’s looks will change in 2015. Toyota will modify the front and rear so that when the full redesign on a new platform takes place in a few years the buying public will not be shocked and polarized. Think of the appearance changes as a two-step process. We also predict three things will happen with the Camry in terms of the drivetrain. A CVT will be added to the transmission line-up. Corolla’s CVT has met with very positive reviews, particularly in comparison to rival Nissan. In the Corolla the CVT increased MPG by about 10%. Camry cannot keep leaving that on the table as Nissan and Honda (and Mazda) now beat the Camry in MPG ratings across the board. If you are worried about the CVT ruining your ride, don’t be. Our test and review of the CVT in the new Corolla should put your mind at ease. Next, Toyota will definitely add Valvematic to its base four cylinder engine. Valvematic in the Corolla added 10% to the MPG rating according to Toyota. Even if it only added 5% in the Camry it would be well worth the cost. Finally, we will go out on a limb here and predict that the 2.0 liter turbo recently announced as part of the Lexus lineup will replace the V6 as the Camry’s top spec engine. Sadly, this is the direction the industry is heading. Want a V6? Buy a Lexus IS 350 for ten grand more, or an Avalon for five grand more. The 2013 Toyota Camry is the leading selling car model in America. Toyota will not sit idly by in 2015 as Accord, Altima, and the Mazda 6 steal its cheese. 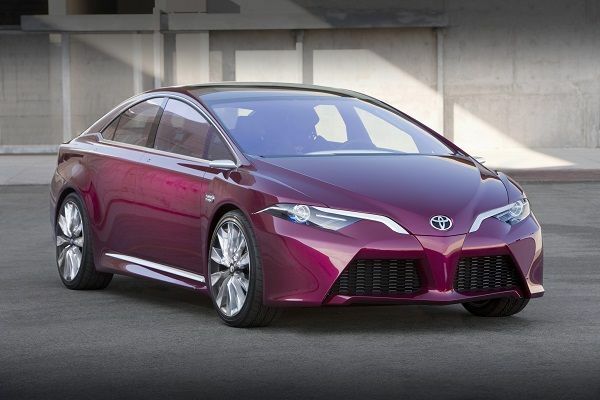 Note: Photos of the Toyota NS4 Plug-in Hybrid Concept courtesy of the Toyota media page. In my opinion this new 2015 Camry is much more good looking than what we have seen before. Although Camry is a great car and despite boring look it has proven itself in the past two decades. Don't forget they need to fix the small offset crash results. Indeed. I really slammed the RAV 4 for that in one story. Good news for Camry buyers is that the Camry has been fixed and now rated "acceptable." Updated story on that in the Toyota Tab. Thanks for commenting. Is the picture shown an early example of TNGA due in the 2015 Prius, a fuel cell prototype or just a future styling preview? Any way it is killer. All I know about it is that Toyota showed it as "The NS4 Plug-in Hybrid Concept." The FCV is a different car and I have posted a picture of that here under the Toyota Tab. Thanks for reading. I like the look too.